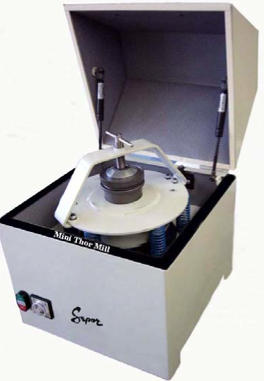 Bench Top Ring Mills have been developed for laboratories pulverising 1 to 100 gram samples. Used for pulverising rocks, soil, coal, cement, glass, limestone, bricks, wood, plant material, slags, concrete etc. for XRF, XRD or other instrumental methods or wet chemistry. Small & compact to fit on a work bench. Head/ Bowls can also be used on the full size Thor Mill. Noise levels are less than 65 dBa. Reduces –1/4” to 325 mesh in 2 minutes. For small samples, ranging from a few grams to 100 grams, the Mini Thor Mill is compact, easy to use and very quiet. Above is a photo of the variety of grinding sets available for the Mini Thor mill, however the Chrome Steel is by far the most widely used set. For contaminant control, the Tungsten Carbide grinding set is the most widely used set.